I collected the information below from different sources and testimonials. I myself was also able to remineralize my 1-year-old son’s tooth about 4 years ago by simply adding fermented cod liver oil to his diet. Now I have a chipped tooth myself and I am thinking to try the tooth remineralization diet mentioned below. Nowadays there are some controversial opinions about fermented cod liver oil (and others too), so please keep this in mind and do your own research before you decide using one or another brand. I am just sharing what impressed me, worked for me and what I am going to try on myself. I am thankful to “Cure tooth decay” facebook group for lots of useful information and tooth rebuilding success stories from the members of the group. You can see some tooth remineralization “before” and “after” pictures in the group. 1st Testimonial: Remineralized Cavity within 6 months. A mother remineralized her 12-year-old child’s cavity naturally within 6 months. The hole was remineralized and no cavity signs were left after 6 months without any dental work. Fermented cod liver oil and butter oil blend capsules – 3 capsules at bedtime. Make sure the teeth are thoroughly cleaned before bedtime. Used “Uncle Harry’s Natural Products Spearmint Toothpaste” all the time before going to bed and in the morning. Water-flossing before bedtime every night. Oil pulling for 20 minutes once a day. Stopped consuming beans and legumes. Legumes may interfere with the remineralization protocol. Stopped consuming everything with soy in it. Used raw milk only, no other types of milk. Used pure butter, cream and ghee. Added lots of fresh and cooked veggies. Meats, chicken and beef were eaten. California brand olive oil with homemade salsa. Only homemade ice-cream with pure cane sugar, egg yolks and cream (occasionally as a treat). 13 year old child’s cavity filling fell off and the cavity was remineralized using the below recipe. 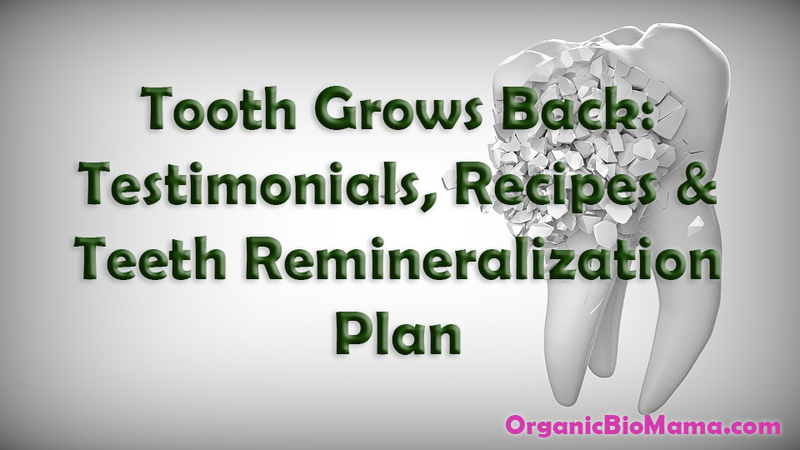 Lots of testimonials about how this formula cured (remineralized) their cavities naturally. Take 1 tsp of powder mixed with honey two times a day with comfrey tea. 5 year old child’s front teeth had a cavity which almost completely healed within six months. Adding mineral drops to his water daily. One of my tooth chipped and got sensitive and I want to see if I can fix the issue. Here is the remineralization plan I made. Make a remineralizing toothpaste and use at least 2 times a day. Water flossing with “Waterpik” every night before bedtime. Oil pulling with extra virgin coconut oil for 20 minutes every morning. Mix Uncle Harry’s Remineralization Liquid with the oil. Bee pollen dissolved in mouth every morning. Slowly work up to 1/2 teaspoon. Eggs for breakfast (maybe not every day), no bread. Bone broth at least 3 times a week, about 1 cup serving for adults, less for children (if they are picky). I will continue using fermented cod liver oil blend despite controversial opinions because I’ve seen the benefits. Consuming lots of cooked and fresh veggies. Use/make natural dipping sauces to make some vegetables palatable for children. Raw grass-fed milk every day. Grass-fed butter, fresh cream (when available) every day or every other day. Dr.Christopher’s Calcium tea made into honey or date balls to make it fun to take (dates and honey are too sweet, so please keep in mind if you have severe cavities). Consume fresh cooked liver once a week. Consume Magnesium every day. Magnesium drink for children in the evening (because it may make them sleepy, so not during day time). Adding Cell Salts to out diet. Propolis extract applied to teeth. Mineral drops added to drinking water or use Shilajit for plant-based minerals. Organic kelp powder with meals. Contains minerals and vitamins which help remineralize teeth. Serving size: 1/8tsp. I will update the post when there are some changes. Update (May 05, 2018): I am not following the full protocol, maybe the half. I am not consistent with everything above. The only thing I am doing regularly is drinking raw milk every day and cod liver oil once every two days or so. I also love butter and take cell salts. I do/consume other items whenever I remember (I know I know…). I eat my bone broth and vegetables regularly. I love using “Waterpik” too. My chipped tooth still looks chipped, but it is not sensitive any more and doe snot hurt. The chipped part stays as is, not bigger, not smaller. Hi biomama, did you heal your cavity? Thank you.